Known as the Murdock Mound, Mound 55 was still standing in 1940 and is shown on the plat map for the area made by a local engineer. It was to be leveled for the construction of houses so a WPA crew under the direction of Harriet Smith examined the area from June 11 to December 14, 1941 (Smith 1941, 1969). Patrick’s indications are that this was a small, conical mound, but he does not give a height. Various maps give the following heights: McAdams Map (1882), 15 feet (4.6 meters); Thomas Map (1894), 10 feet (3.05 meters); Peterson-McAdams Map (1906), 8 feet (2.4 meters). Smith, in her 1942 summary, describes Mound 55 as an oval 9 feet (2.7 meters) in height and 150 feet (45.7 meters) by 135 feet (41.15 meters) in base dimensions. This is one of the most interesting sets of data indicating the deflation of a mound by cultivation. The Goddard air photos of 1922 show this mound in a cultivated field. Mounds 50 and 54 to the north were apparently almost completely destroyed by cultivation by the time these photos were taken. If the heights listed above can be taken as representative of the changes in Mound 55 through time, it is probable that destruction of this mound by plowing took place in the late nineteenth century. Harriet Smith’s profile drawings from her 1941 excavations show considerable disturbed or redeposited sediments spread out around the base of the mound. This is probably the result of cultivation. The difference in form as shown by Patrick (conical) and described by Smith (oval with the longest dimension north to south) is also probably the result of plowing. We can conclude that in the 1870s the Murdock Mound was a conical mound perhaps 15 to 20 feet (4.6 to 6.1 meters) in height. This is very probably its original form. Thanks to Harriet Smith’s detailed work, this is one of the most completely excavated and examined mounds at the Cahokia site (Smith 1941, 1969). In all, 13 stratigraphic levels were determined, five in a village or habitation area below the mound and eight in the pyramid or mound structure itself. It is Harriet Smith’s interpretation that the Murdock Mound was built as a double-terraced mound with a lower platform extending across the west face; a higher platform, which she labels the Temple Platform, was on the east half of the mound. She suggests that the northeast and southeast corners of the mound were faceted. The basal outline of the mound, including the faceted northwest and southwest corners, was found in the excavations. Only a few feet of the height of the mound slopes were actually uncovered. The upper portions had been presumably destroyed by cultivation of the area over several decades. 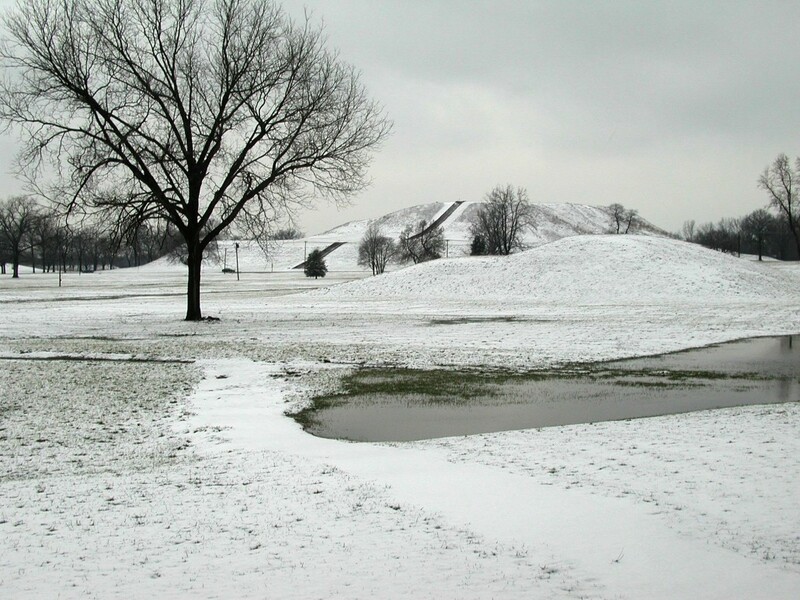 Smith’s reconstructions of both the terracing of the mound and its total height were based upon her projections of the slopes and faceted corners and her interpretation of ancient Cahokia engineering principles. On this basis, she projects a height for the west-facing terrace of 16.5 feet (5 meters). The eastern half, or projected Temple Platform, she proposes was 33 feet (10.1 meters) in height. The higher estimate is not consistent with the earlier figures for the pre-cultivation height of the mound, but the height proposed for the western portion, 16.5 feet (5 meters), is very nearly identical to the earliest (1882) value of 15 feet (4.6 meters). Mound 55 was built primarily of a black gumbo which made a very compact and stable mound. When the mound was abandoned, materials from the upper levels eroded down, and it was from some of this wash material that a radiocarbon date of A.D.1350 i 75 was determined (M-1290). Smith interprets this as dating the time of the latest utilization of Mound 55.